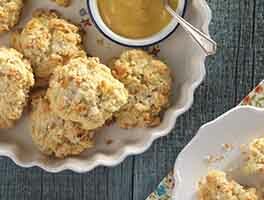 These deep-gold scones are as tasty as they are pretty. Cinnamon, ginger, allspice, and nutmeg spice the dough; diced crystallized ginger and cinnamon chips take their flavor over the top. In a large mixing bowl, whisk together the flour, sugar, baking powder, salt, and spices. Stir in the ginger and/or chips/bits, if you're using them. Add the pumpkin/egg to the dry ingredients and stir until all is moistened and holds together. Scrape the dough onto the floured parchment or pan, and divide it in half. Round each half into a 5" circle (if you haven't incorporated any add-ins); or a 6" circle (if you've added 2 cups of fruit, nuts, etc.). The circles should be about 3/4" thick. 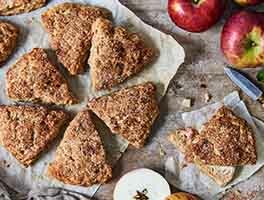 Bake the scones for 22 to 25 minutes, or until they're golden brown and a toothpick inserted into the center of one comes out clean, with no wet crumbs. If you pull one of the scones away from the others, the edges should look baked through, not wet or doughy. Wondering what to do with the rest of the canned pumpkin? Scoop onto plastic wrap or into a small container, and freeze. It'll be ready and waiting next time you want to make these scones. If you're really serious about using your ingredients most effectively, use a scant 2/3 cup pumpkin (a scant 5 1/4 ounces), rather than the full 2/3 cup called for. You'll find a typical 15 1/2-ounce can of pumpkin will then be enough for three batches of scones. I love ginger and used 1.5 cups, but it was way too much. I don't understand why the recipe stated 1-2 cups. I will make them again and cut back to no more than 1 cup, maybe even 3/4 of a cup. Don't really taste any pumpkin, but I assume it's there for moisture. These should be called Ginger Pumpkin Scones. Oh wow. These are wonderful. I followed the recipe exactly. I used 1/2 cup chopped crystallized ginger and 1/2 Hersey's cinnamon chips (from Amazon). I baked 23 minutes and they were perfect. I will definitely make these again. These were OK. I think my taste testers have been spoiled by the triple cinnamon scones! My scones turned out quite dry. Not moist and fluffy like scones usually do. 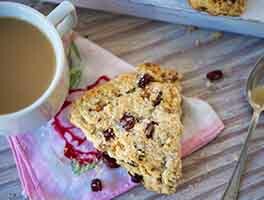 I have baked the KAF basic scones and those are wonderful! I followed the recipe to a tea. I'm wondering why they were so dry. Did I overcome bake them? I baked them for 20 min. Hi Camila! The most common reason a recipe turns out dry is if any extra flour was packed (which flour likes to do!) into the measuring cup. Delicious! I had some pumpkin left over from a cookie recipe I made, which I didn't like, but I figured the pumpkin would be good in a scone. Boy, was I right! 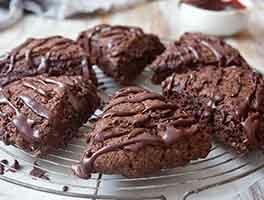 I made this just like the recipe, using Hershey's cinnamon chips. YUM! I would like to recommend these, because they tasted fine once I removed the burnt bottoms. I baked them for the shortest time recommended. Any suggestions? I also baked some muffins that day in the same oven without any problem. So we can rule out a faulty oven. These were delicious! I did not have crystalized ginger and substituted dried cranberries. I used fresh ground ginger along with the other spices. I did everything in the food processor and just pulsed lightly scraping down the bowl to fully incorporate all ingredients. I froze them according to directions. These were a hit with everyone who ate them! Very easy to put together and have on hand in the freezer. Thank you! 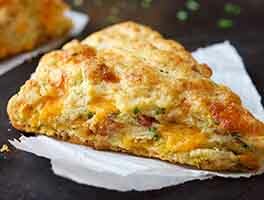 Some of the best scones ever! I used only a 1/4 cup of crystallized ginger and whirled it in the food processor with the dry ingredients to break it down a bit. Used brown sugar instead of white sugar. Skipped the cinnamon chips, but doubled the spices. Chilled in the fridge about 20 min before baking. Super YUM!! In regards to using sweet potatoes in place of pumpkin puree would I use 2/3 cup of mashed sweet potato? And would it need any additional liquid as I believe the sweet potato will be much drier? Thanks.